The Journal of ASEAN Studies is pleased to present our new edition: Volume 3, Number 1, published in the first half of 2015. This is the fifth publication of our bi-annual peer-reviewed scholarly international journal that discusses an invigorating debate on current milieu of Southeast Asian affairs. 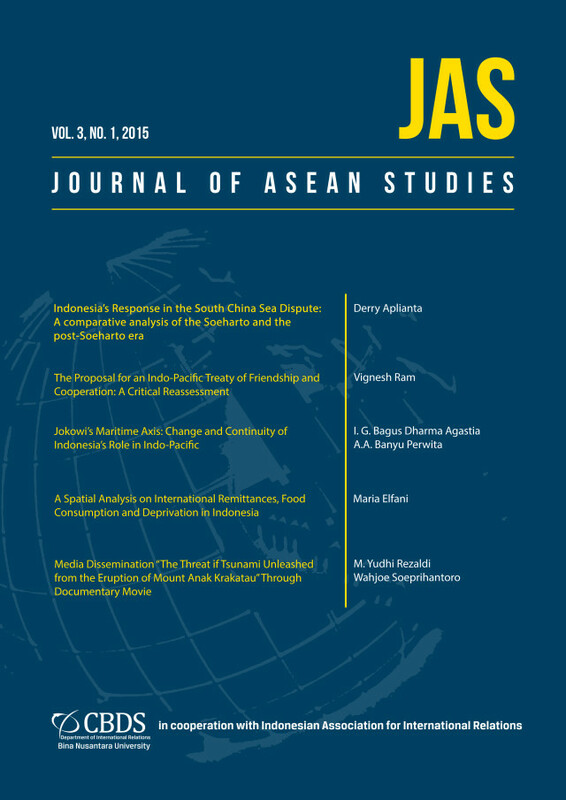 In this issue, Journal of ASEAN Studies introduces a series of discussions that are mainly focused on the dynamics of Indo-Pacific relations and the power struggle in the highly highlighted South China Sea disputes. Besides, this issue also comes up with an inquiry on the spatial analysis of the impact of remittance in Indonesian households. In this publication, we are also glad to announce that the Journal of ASEAN Studies has been indexed by the Social Science Open Access Repository (SSOAR) starting from January 2015. As such, Journal of ASEAN Studies has now been indexed by eight international journal indexing entities. In order to continue this achievement, we are working hard to provide a qualified and most invigorating debate in the area of Southeast Asian studies both domestically and regionally. We hope that this issue will contribute to stimulating a significant intellectual discourse in the area of Southeast Asia.